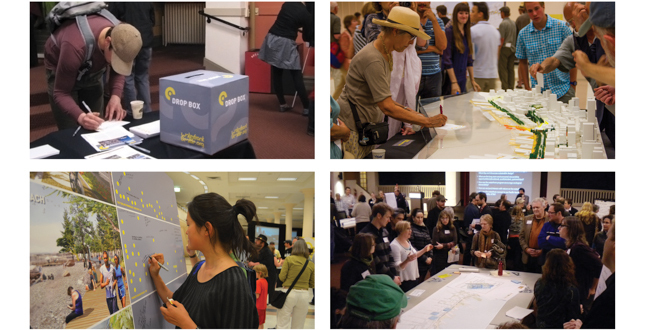 Committed to innovative and energetic public engagement reaching broad and diverse communities, the design team used strategies that included large public meetings, targeted briefings, partnerships, and roundtable discussions with more than 50 organizations. 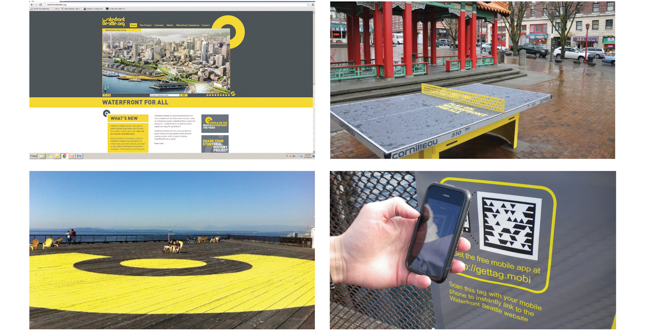 A specific identity and website were created for the project at waterfrontseattle.org to allow continuous access to information about the project and offer ways for the public to engage with the planning process. 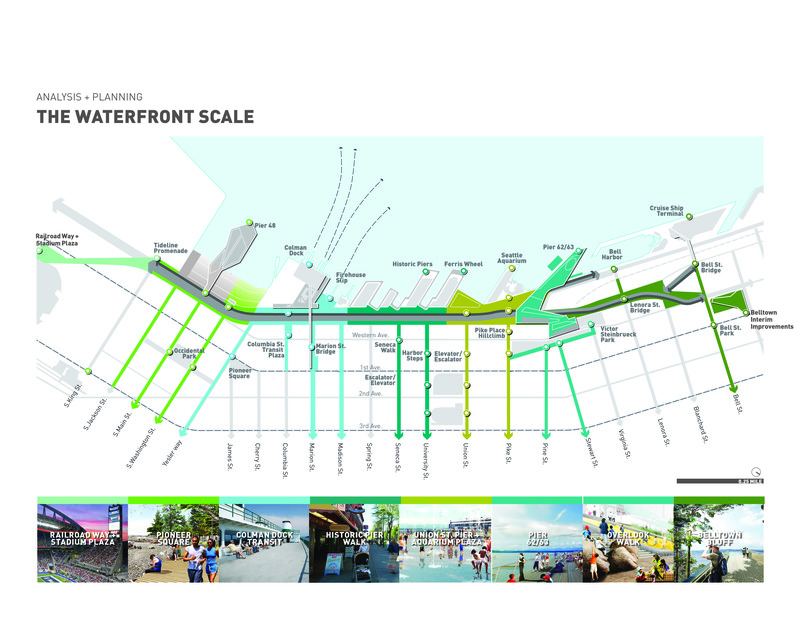 Waterfront Seattle is a comprehensive vision which considers the planning and design of the central waterfront across a range of scales: the city scale, the urban scale, and the waterfront scale. The waterfront was organized by zones of programmatic focus. At the heart of the new waterfront are a great urban street and pedestrian promenade. As the spine of the waterfront, they connect existing shopping, dining, boating and cultural activities to each other, to new waterfront destinations and to the city beyond. Those include specific neighborhoods such as Pioneer Square and Belltown, a retail area at the historic piers, a transportation hub around Colman Dock and a large central public open space including two large public piers and a proposed Overlook Walk to link Pike Place Market on the hill with the Aquarium on the pier and provide an extraordinary outlook on the Bay. Seattle's public piers offer a engaging venue for dramatic views across the bay, boat and ship watching, gathering and festivals as well was daily activities. 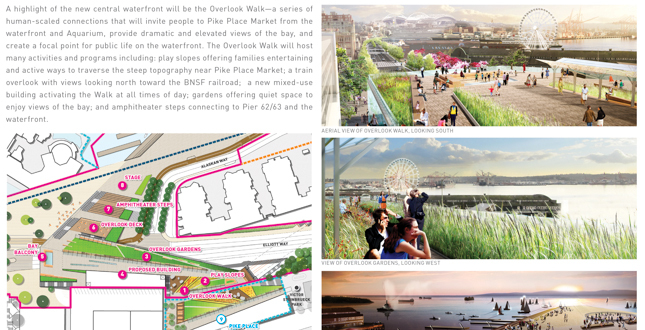 A highlight of the new central waterfront will be the Overlook Walk—a series of human-scaled connections that will invite people to Pike Place Market from the waterfront and Aquarium, provide dramatic and elevated views of the bay, and create a focal point for public life on the waterfront. 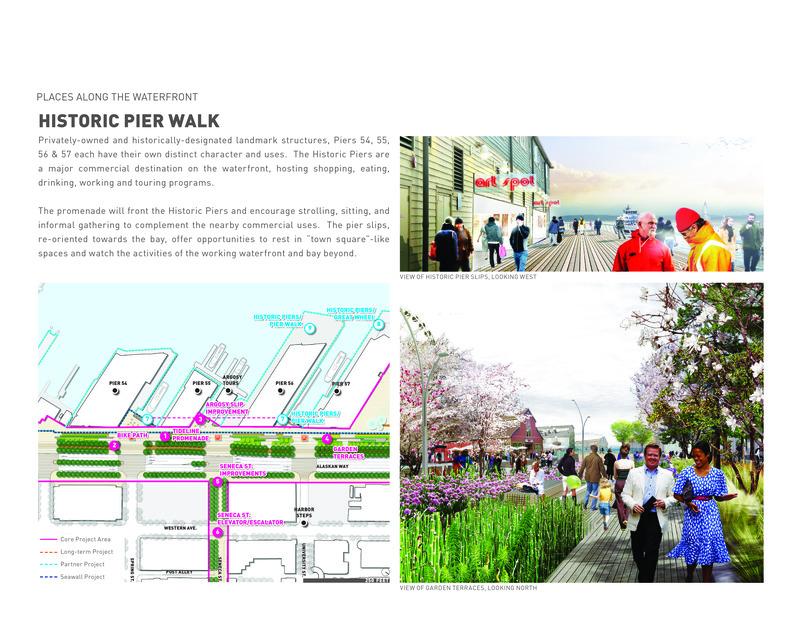 Pier 62/63 will be a primary public space on the waterfront. 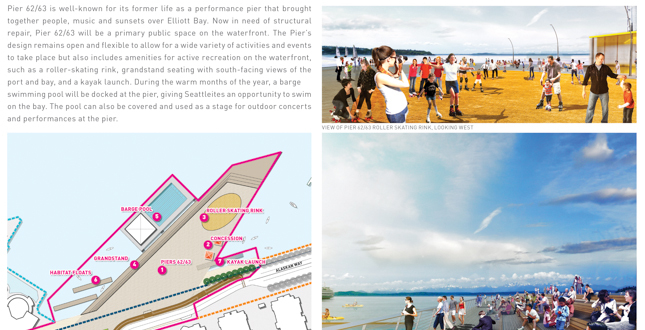 The Pier's design remains open and flexible to allow for a wide variety of activities and events to take place but also includes amenities for active recreation on the waterfront, such as a roller-skating rink, grandstand seating with south-facing views of the port and bay, and a kayak launch. 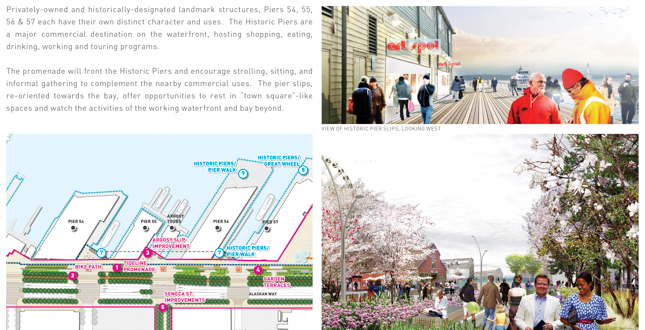 The promenade will front the Historic Piers and encourage strolling, sitting, and informal gathering to complement the nearby commercial uses. Union Street Pier will be a flexible, open and vibrant space with unobstructed views of the bay, used for a variety of activities from kids play to programmed events and performances. 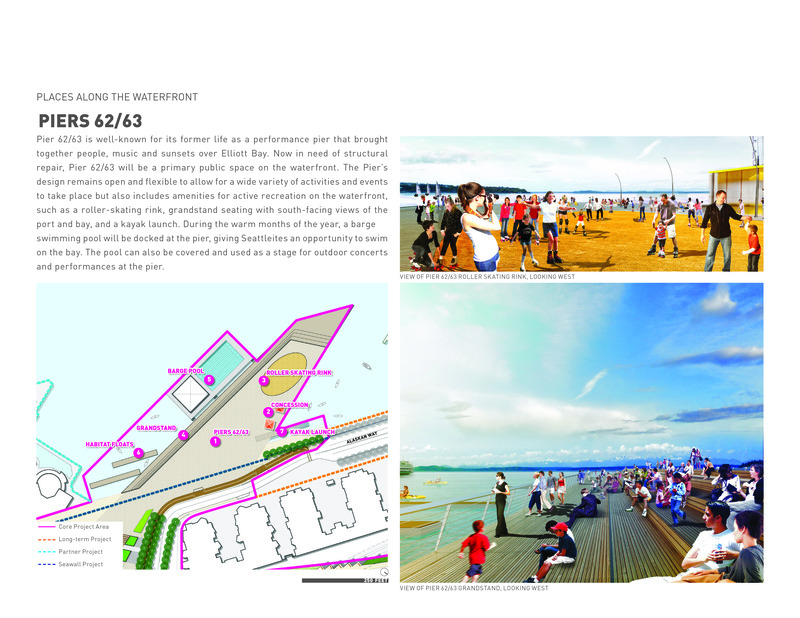 The Waterfront Art Plan develops a multipronged approach for art on the Central Seattle Waterfront. It considers the history of the site as a working waterfront, the physical conditions of its location along the shores of Elliott Bay and its role as part of Seattle's evolving urban and cultural landscape. 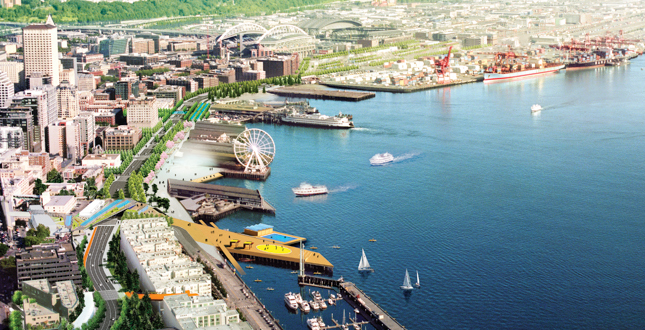 The City of Seattle acknowledged that the large infrastructural works they had to undertake created an opportunity to re-imagine their aging central waterfront and create a new “waterfront for all”. 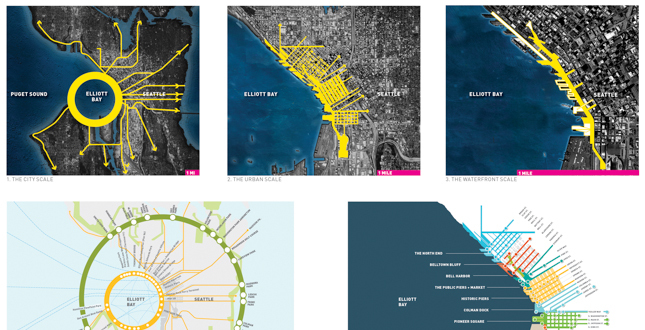 This study responds to the opportunity with a Concept Plan for the areas affected by the infrastructural work as well as a Framework Plan for all adjacent areas, thus creating a complete vision to transform the central waterfront and reconnect Seattle to Elliott Bay. 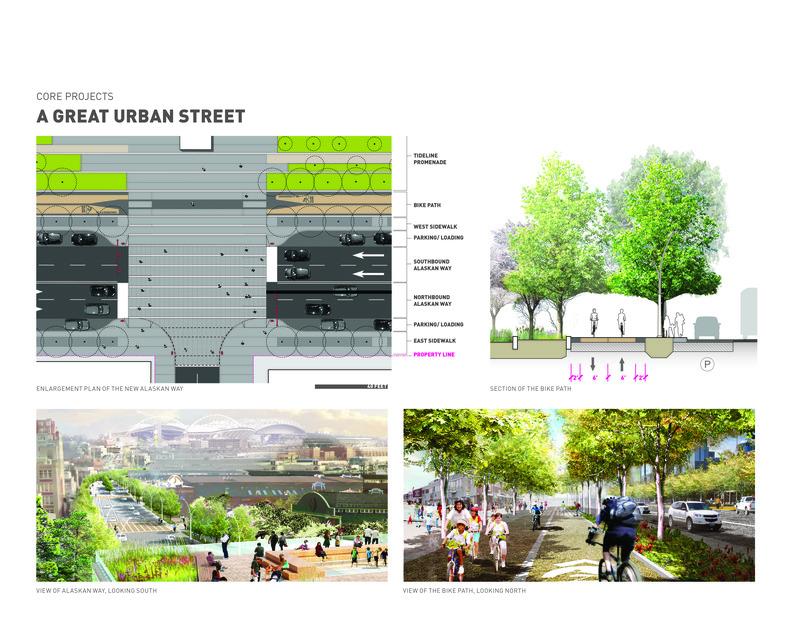 Both the City of Seattle and the general public were involved in every step of analysis and planning, including the selection of the design team, in an exemplary democratic process. 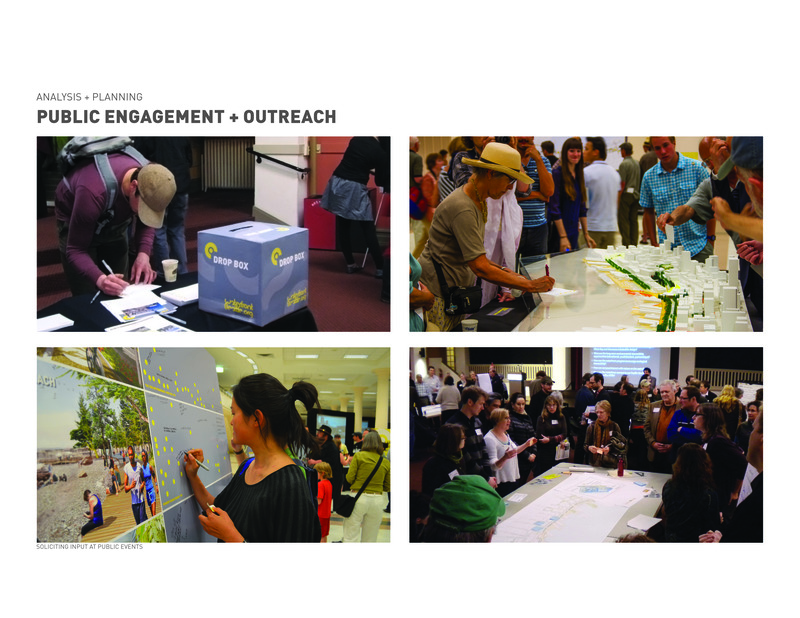 Committed to innovative and energetic public engagement reaching broad and diverse communities, the design team used strategies that included large public meetings, targeted briefings, partnerships, and roundtable discussions with more than 50 organizations. The focus has been not only on a high volume of input from diverse sources, but on meaningful, specific input to shape the future of the design. Outreach focused on drawing new audiences to the waterfront, bringing program out into the broader community and leveraging partnerships with community organizations and leaders. 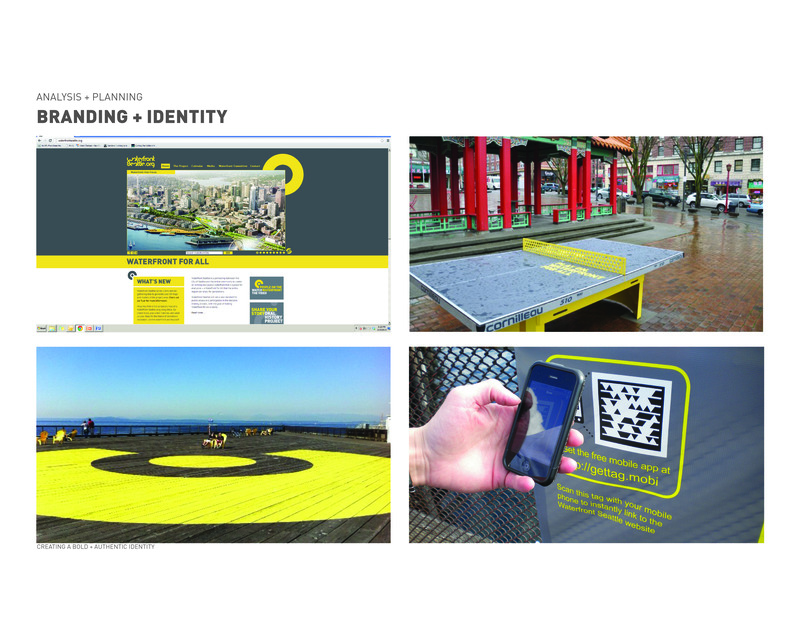 A specific identity and website were created for the project at waterfrontseattle.org to allow continuous access to information about the project and offer ways for the public to engage with the planning process. 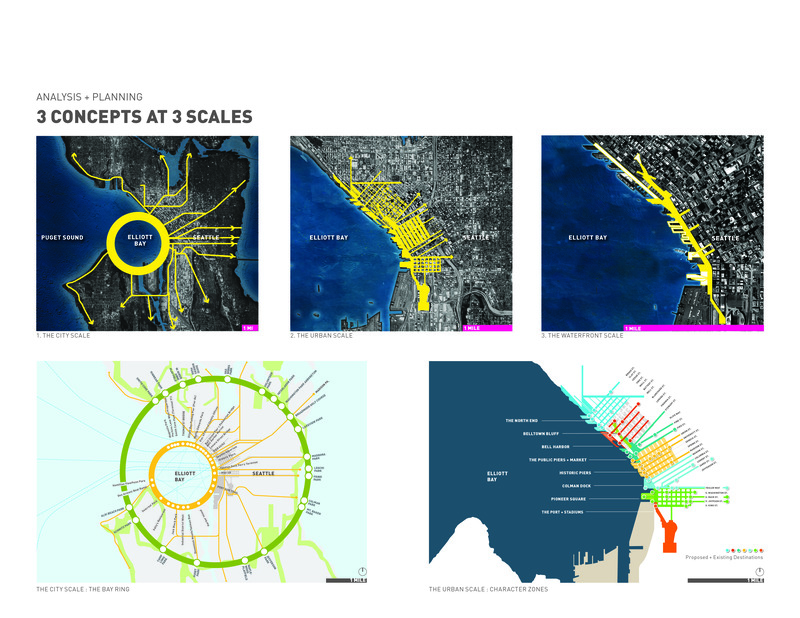 Waterfront Seattle is a comprehensive vision which considers the planning and design of the central waterfront across a range of scales: the city scale, the urban scale, and the waterfront scale. As such it places urban design in a leadership position. 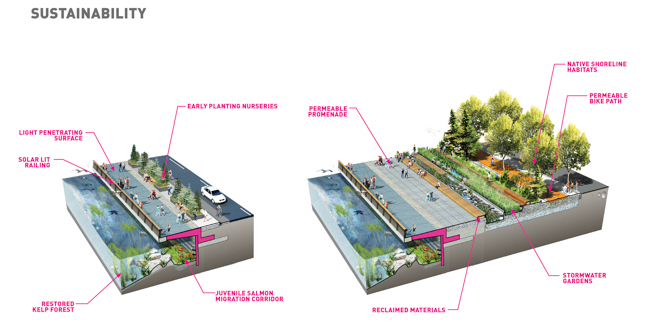 The landscape architect led a complex team of engineers, ecologists, artists and art consultants, graphic and identity designers, architects, and transportation consultants to work with the city's many stakeholders in creating this vision. The history of Seattle's waterfront is one of industry, shipping and transportation. 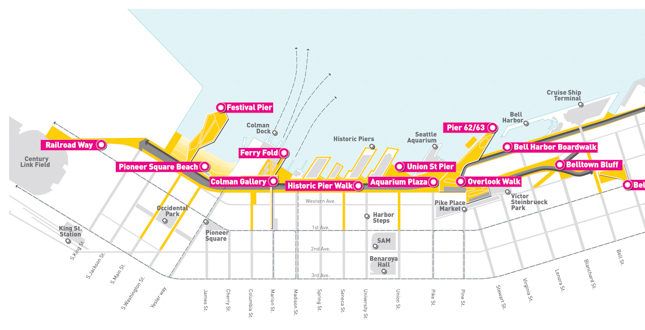 The city grid, which obeys the traditional North South orientation in Pioneer Square and keeps the original settlement's layout, shifts further north to follow the curve of the Bay. The water's edge was constructed several feet out from the original natural shoreline, and was built to accommodate industrial uses, shipping and railroads along the Bay. Piers were built close together over deep water disrupting the original salmon migration path which needs to follow shallow waters along the Bay's edge. 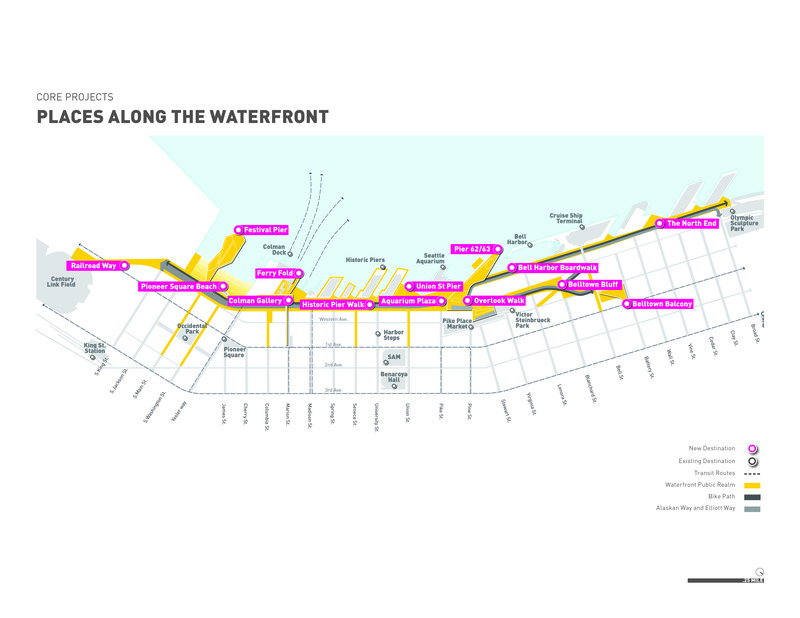 Topography gets steeper from south to north, with an 85' separating Pike Place Market and the Aquarium. From old Pioneer Square occupying the lowest and flattest portion of the site, to Belltown on the remains of Denny Hill; from the Pike Place Public Market on Denny Hill with all its constituencies to the Seattle Aquarium perched on a public pier in the center of the site; from Olympic Sculpture Park at the north end to the Stadiums at the South end; from Colman Dock serving thousands of commuters ferrying back and forth across Elliott Bay to the Port of Seattle, its large cranes and commercial ships on the south end and its marina and cruise ships on the north end; from retail piers serving tourists all years round to the BSNF railroad cutting through the site; together with the Alaskan Way Viaduct's heavy traffic, all make the central waterfront an extremely busy and complex place. Over the years all parts of the central waterfront have grown more divided and conflicted. Neighborhoods along the waterfront are fragmented and the city is cut off from the Bay by the Alaskan Way Viaduct. 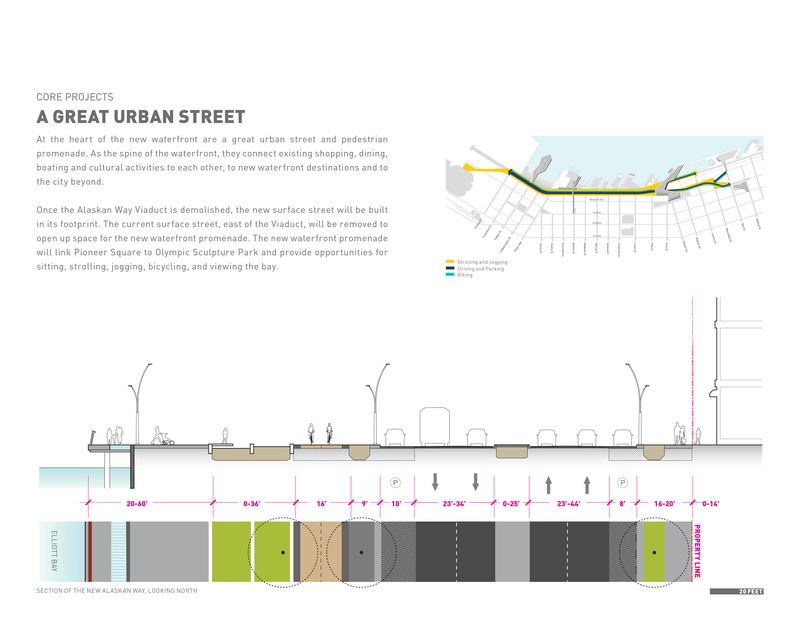 A number of urban design strategies were used to organize and accommodate all waterfront activities and uses, solidify the vision and anchor the design into the urban fabric and make one coherent place with its own distinct identity. 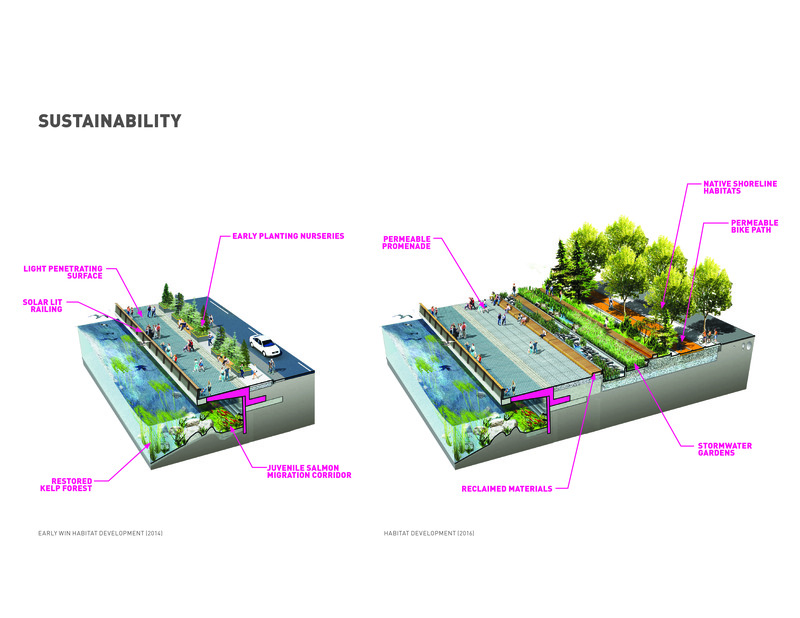 Sustainable strategies were developed to include opportunities for improving urban systems on the waterfront ecologically, environmentally, economically and socially. The waterfront was organized by zones of programmatic focus. Those include specific neighborhoods such as Pioneer Square and Belltown, a retail area at the historic piers, a transportation hub around Colman Dock and a large central public open space including two large public piers and a proposed Overlook Walk to link Pike Place Market on the hill with the Aquarium on the pier and provide an extraordinary outlook on the Bay. At the heart of the new waterfront are a great urban street and pedestrian promenade. As the spine of the waterfront, they connect existing shopping, dining, boating and cultural activities to each other, to new waterfront destinations and to the city beyond. 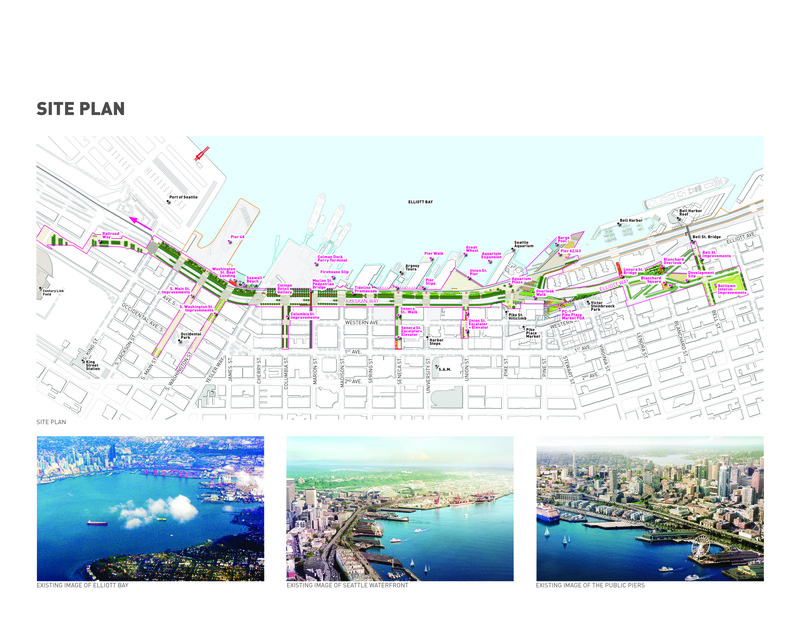 Once the Alaskan Way Viaduct is demolished, the new surface street will be built in its footprint. 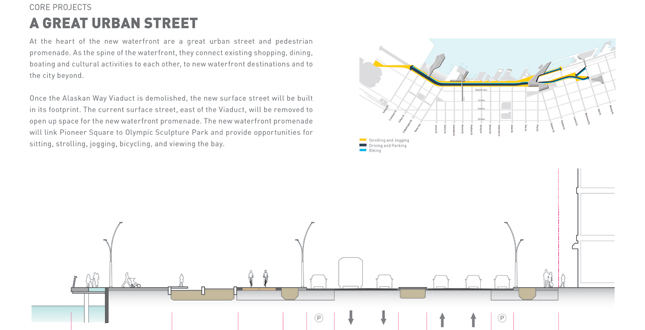 The current surface street, east of the Viaduct, will be removed to open up space for the new waterfront promenade. 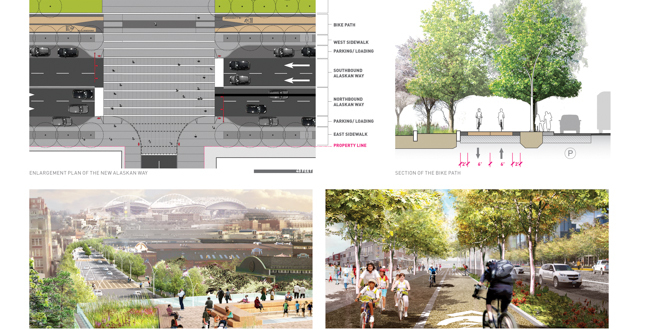 The new waterfront promenade will link Pioneer Square to Olympic Sculpture Park and provide opportunities for sitting, strolling, jogging, bicycling, and viewing the bay. The access and mobility strategy analyzed the patterns of each mode of transportation, including vehicles, freight, bicycles, ferries and pedestrians, and balanced their needs to prioritize a pleasant and safe public realm. 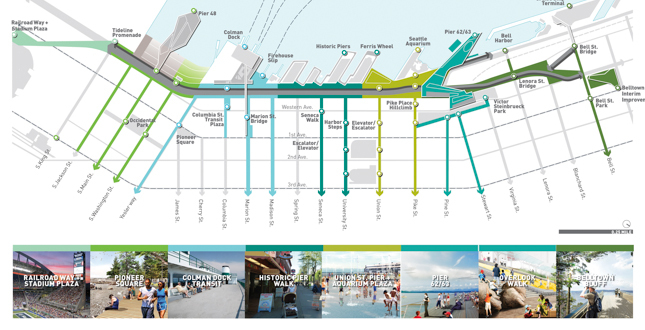 Improved East-West connections and enhanced access to the waterfront will allow the vision for Seattle's Central Waterfront to extend into the heart of the city and for the City of Seattle to claim a new and authentic front porch on Elliott Bay. 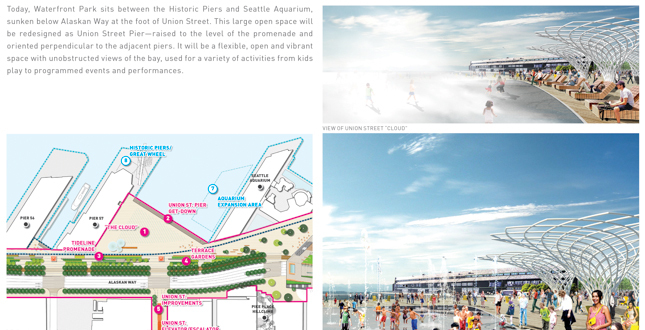 The design of the core projects and continuous elements, the materiality of the water's edge and the seawall, streets and urban frontages will all guide the future developments both by the city of Seattle and private land owners – guaranteeing that the vision of the waterfront for all is feasible and executable over time. 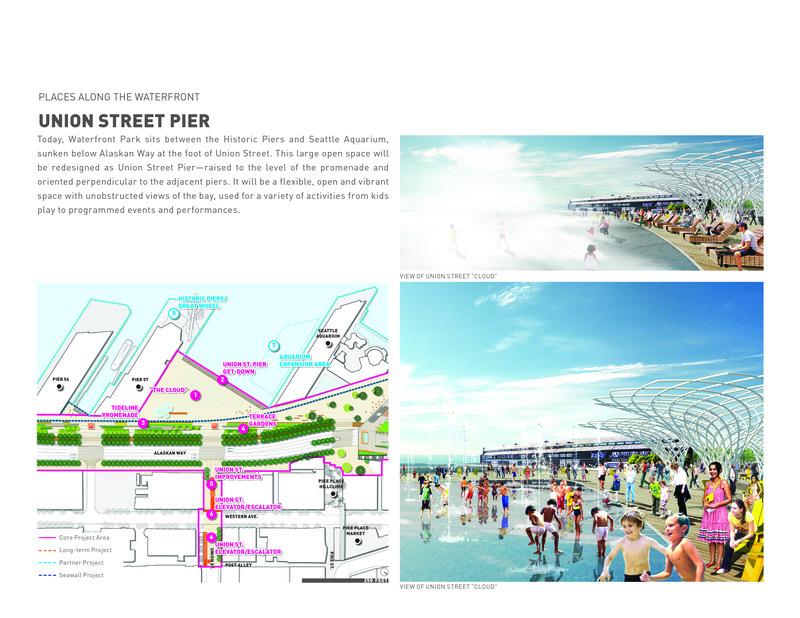 The Waterfront Art Plan develops a multipronged approach for art on the Central Seattle Waterfront. It considers the history of the site as a working waterfront, the physical conditions of its location along the shores of Elliott Bay and its role as part of Seattle's evolving urban and cultural landscape. It anchors the waterfront art program in the overall Framework Plan and works with it to reveal and develop the unique character and identity of the site. 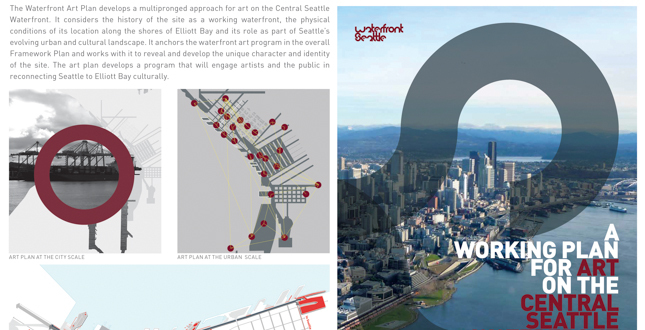 The art plan develops a program that will engage artists and the public in reconnecting Seattle to Elliott Bay culturally. 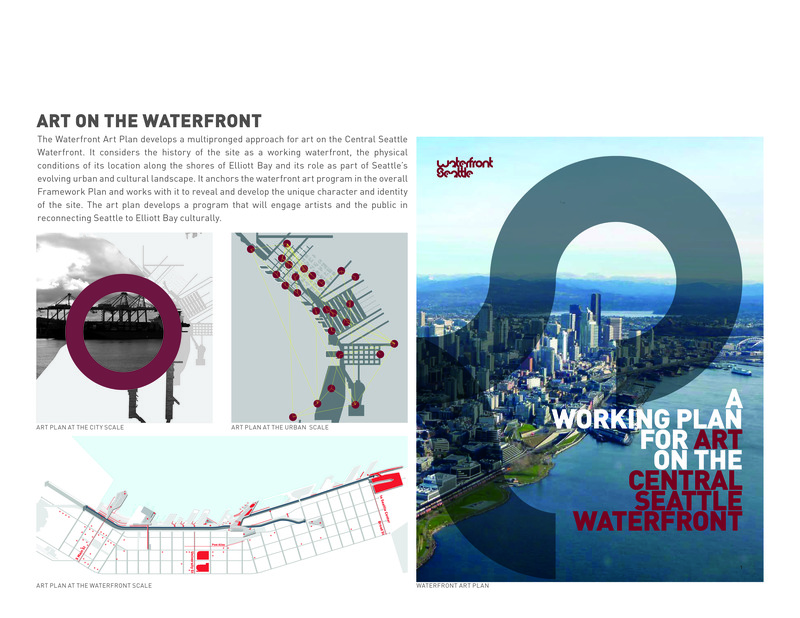 The planning and design document - Waterfront Seattle – represents the culmination of the first 21 months of conceptual work initiated by the City of Seattle's Guiding Principles. 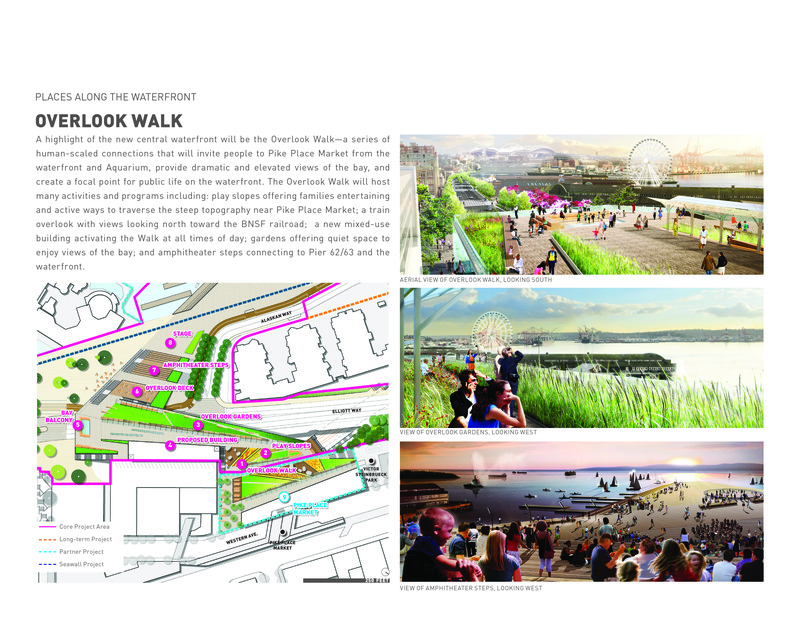 It comprises five volumes summarizing the ideas developed to date by the Waterfront Seattle planning and design team, based on a detailed planning-level analysis of the site, as well as on an extensive outreach effort that engaged civic groups, property owners, stakeholders and the relevant city, state and federal agencies. 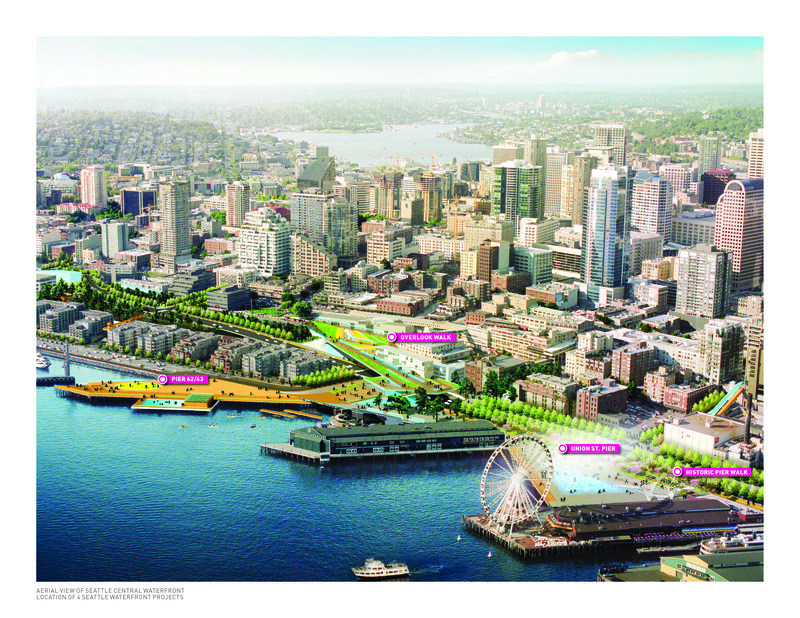 A strategy for implementing the long term vision for Waterfront Seattle identified the “Core Projects” which collectively make up an early phase of waterfront redevelopment. 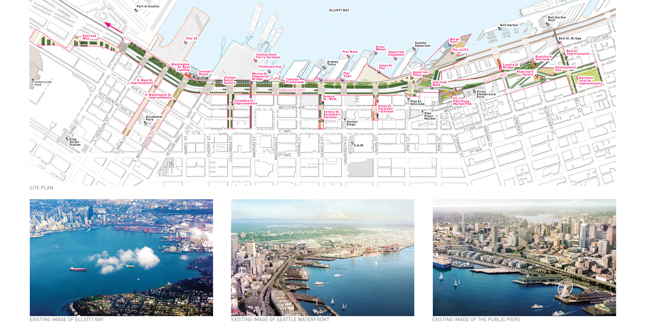 These projects can move forward more quickly because the sites are owned by the City of Seattle, have identified funding sources and are directly related to the removal of the Alaskan Way Viaduct and replacement of the Elliott Bay Seawall. They are likely to be completed in the next 5 to 8 years. 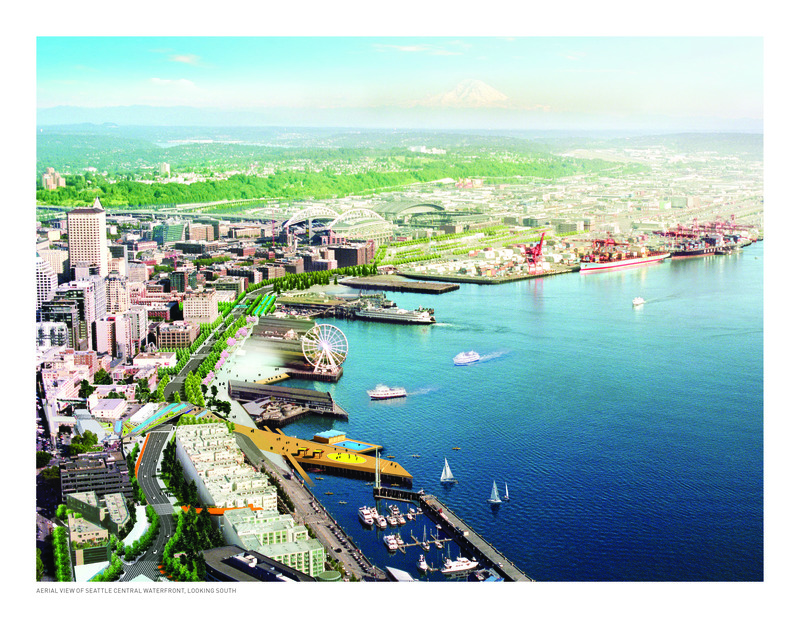 In addition, partner projects were identified for the city to work with owners of properties directly adjacent to the project site to continue implementing the vision for the Waterfront Seattle in the years to come. A not-for-profit organization, “Friends of Waterfront Seattle”, was created from grassroots support for the project with outreach, education, advocacy and fundraising. 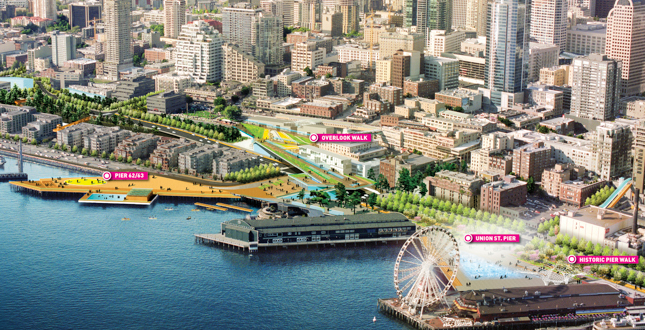 It hopes to foster stewardship for Waterfront Seattle.